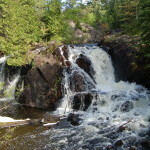 The Marquette area has become well known over the last few years for its amazing outdoor recreation opportunities, including several stunning waterfalls. 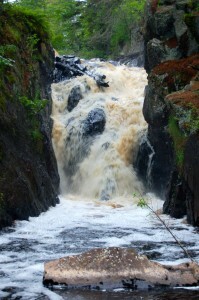 Black River Falls is just a short drive away, and worth a visit if you’re in the area. 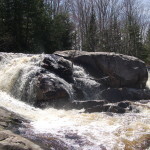 The Black River makes a total drop of 30 feet here in a forested setting south of Ishpeming, ending with a plunge of around 15 feet before the river pools and calms. 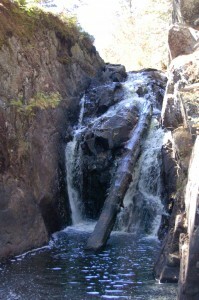 This waterfall is a little off the beaten path and there’s a good chance you’ll have the area all to yourself. The walk to the falls from the small parking area is easy to start out, but it gets a bit steep and rocky as the path nears the river. A wooden footbridge helps visitors make the final descent to a small island in the river that provides a straight-on view of this powerful waterfall. 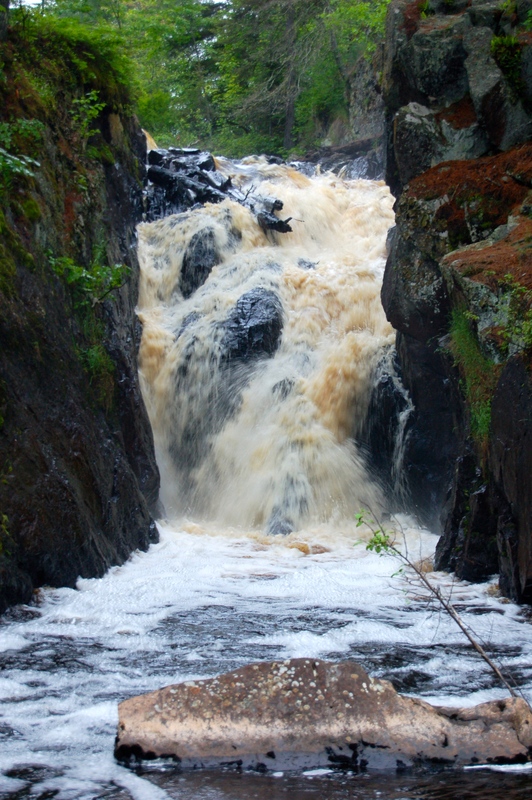 We’ve visited several times, and found the best flow in the late spring and early summer; in the fall Black River Falls was barely a trickle (see below). Our last visit was in June 2016 after a few days of rain. While this made the waterfall stunning, it also made the roads leading back to the falls a bit tougher to navigate, even in a higher-clearance vehicle. 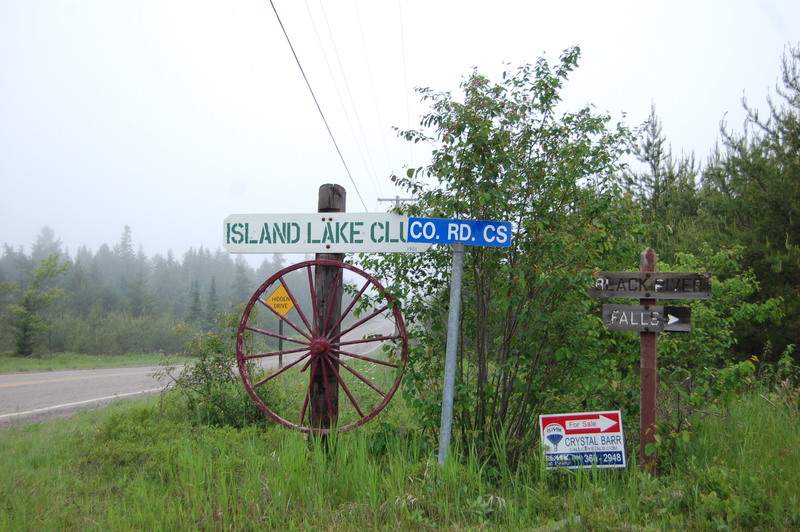 From M-28 west of Ishpeming, turn onto N. Lake Dr. and follow it for about a mile, then head south on Washington St. Take Washington south for about a mile, then turn right onto Saginaw St. (which is also CR-581). Stay on CR-581 for about 8 miles, then turn right on Co. Rd. C5/Black River Rd. (see below for a picture of that intersection). 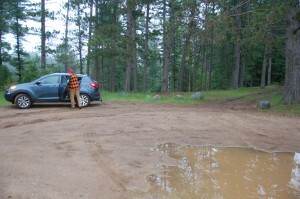 Take this dirt road back to the falls, making turns when wooden “Black River Falls” signs instruct you to do so. 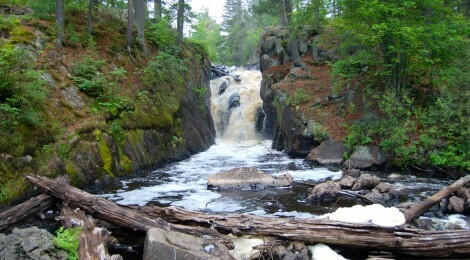 There are more than 200 waterfalls in Michigan’s Upper Peninsula, and each one is different and unique. 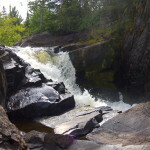 Black River Falls can be incredibly picturesque at the right time of day after spring melt or a heavy rain, and since it is not likely to be busy back here this is a great spot for quiet reflection. 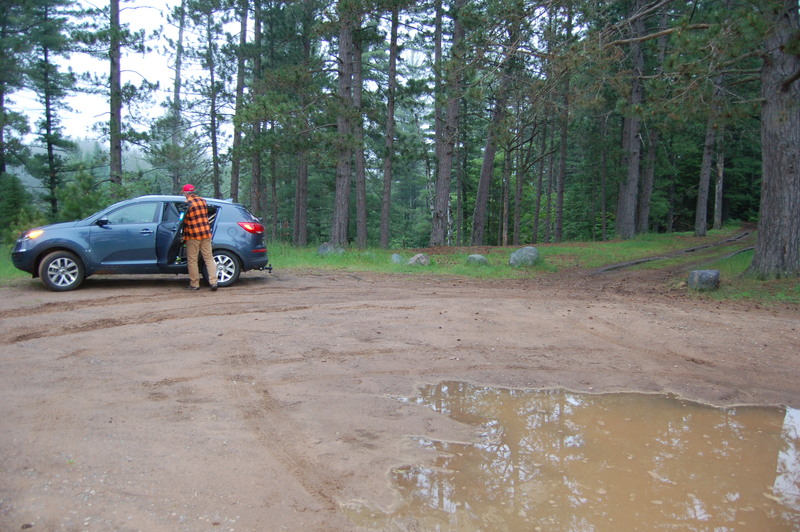 The area near the parking lot has the feel of an old state forest campground, though it’s pretty obvious it’s been years since there was much activity. Check out the video below to see what this waterfall looked like in June 2016. 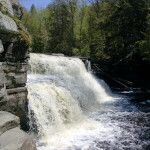 Other nearby waterfalls include Ely Falls, Warner Falls, Schweitzer Falls and Morgan Creek Falls.